Archer Engineering provides industrial prototyping and rapid prototyping services to client across the United States. 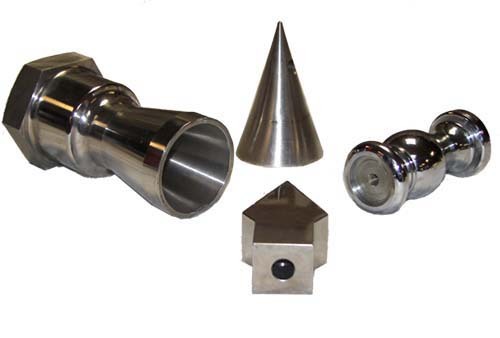 Our machining capabilities consist of turning, threading, drilling, milling and welding and sizes ranging in 1/4" to 4" diameters. When custom-made parts are required, but quantities are not sufficient for regular production, or when a customer is trying to accomplish different design results, industrial prototyping services are used. In order to test ideas, prototypes of parts will be made and used. To accomplish a desired prototype or enhance an existing product, some changes might be applied. The changes included changing lengths, thread pitches, size and material. A few examples of part changes include improving the life of a part by upgrading material and heat treating, limit loss due to corrosion by changing material, improve the parts capacity by increasing its size and increasing the rate of travel by changing thread pitch or changing the thread lead. Whether the changes are major or minor rapidly producing the part will be done after prototypes have been tested and proven. Rapid prototyping will be accomplished by expediting every step of the processes of manufacturing. Since every customer requirement is different an exact time for every prototype project will vary. Factors such as availability of material, current workloads and needed outside sources will determine Rapid prototyping time. Any material can be used when making a prototype. First, our team works with you to establish the part requirements and the intended application of the product. Important features to consider include strength, weight or corrosion resistance needed for the intended application. At Archer Engineering our team specializes in prototyping a variety of products including bolts, nuts, studs, shaft, ping, brushings and more. Our team follows the SAE (Society of Automotive Engineers), ASTM (American Society of Testing Materials), IFI (Industrial Fastener Institute), ASME (American Society of Mechanical Engineers), and Mil-Std (military standards).